Hi, why I can`t see my portfolio items by tag? And my version theme 1.06, how I can update to 1.07? You can download the latest version of the theme in Theme Forest on your Download section. Those work only with Portfolio Categories not tags. I use this. For what tags portfolio? If I choose tag "Sun" on some portfolio Item, how I can show only this tag? 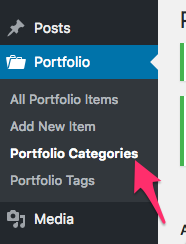 You don't have to use tag, you have to use portfolio categories. Those are the one used for the filter.